The California senator hasn’t announced she’s running yet, but a potential path to the Democratic nomination is taking shape. Sen. Kamala Harris’ advisers are privately discussing a rough Democratic primary strategy that would focus heavily on Iowa, but with an eye toward high-value nominating contests coming later in Nevada, South Carolina and California — more diverse states where her candidacy might resonate with larger minority communities. Harris, a first-term senator, would still face significant obstacles in each of those states. But as a black woman who has also won statewide elections in California — where the black proportion of the electorate is relatively small — Harris could be well positioned to compete in both the Southeast and the West. While Harris has yet to announce she is running for president in 2020, all signs point in that direction — especially her upcoming travel schedule. She’ll make a stop this week in the South’s first primary state, South Carolina, and will likely campaign later this fall in California. On Monday, she touches down in Iowa for her first test of viability in the first-in-the-nation caucus state. She’ll be in Iowa on Oct. 22-23, making appearances in Des Moines and Cedar Rapids, with other stops expected to be added. 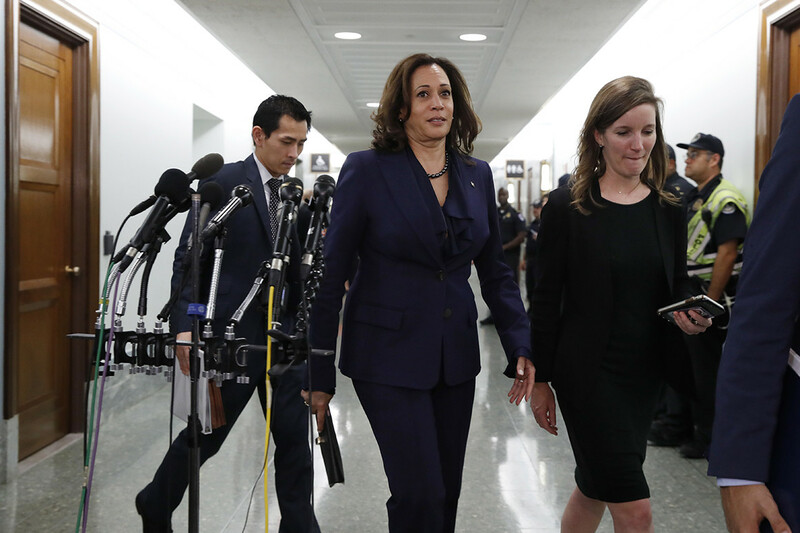 Harris’ advisers believe she can compete in Iowa based in part on her success courting white progressives in California and on former President Barack Obama’s victory there in 2008. Harris campaigned for Obama in the state that year. The next nominating contest, in New Hampshire, presents a far heavier lift. She has yet to appear there, and several potential East Coast contenders — including Sen. Bernie Sanders (I-Vt.), Sen. Elizabeth Warren (D-Mass.) and former Massachusetts Gov. Deval Patrick — are all considered to have an edge in the state based on their name recognition and familiarity. But if Harris can win over black voters in South Carolina, the first Southern primary, her advisers believe she could then win a spate of early Southern primaries with high black turnout — in 2016, 10 states with black primary turnout exceeding 25 percent had already held their nominating contests by mid-March. And North Carolina, another state with relatively high black turnout, is moving its primary in 2020 to early March, as well. Meanwhile, Harris would campaign aggressively in Nevada and neighboring California, likely relying on supportive labor unions and activists in her home state to cross state lines and campaign for her in Nevada, as they have for Democratic allies in previous elections. For Harris, California offers more than a home-state edge and a massive delegate haul. The state is physically distant from Iowa, South Carolina and New Hampshire, and it’s expensive to increase name recognition in the state’s large media markets, raising the prospect that some candidates will bypass it to conserve resources. “We think it’s really, really hard to compete with her in California,” one adviser said. Harris’ path in the early primary states — especially South Carolina — remains far from certain. Sen. Cory Booker, a New Jersey Democrat who is also black, has made inroads in South Carolina, and former Vice President Joe Biden has long-standing relationships in the state. Every serious Democratic contender in 2020 will focus heavily on South Carolina due in part to its relatively small size and inexpensive cost of advertising. That may not be the case in California, but Harris would hit a different obstacle back home — several other Californians may run, including Los Angeles Mayor Eric Garcetti, cutting into her home-state advantage. “People like Harris or Warren or name your candidate, a lot of these folks have been preparing for this for a very long time,” she said. Andy Murray: Did we all just retire the Briton too soon?